Congratulations to Meaghan, Martha and Sandra, the winners of Karen's giveaway. Thank you to all who participated! I believe in second chances—with our kids who make mistakes, with friends who let us down, and even with the man or woman we love who hurt us. My March release, RETURN TO GRACE, is a mystery/thriller and a love story with that in mind. It is set in Amish country, a peaceful, lovely place where crimes seem more terrible than in “worldly” society. Hannah Esh, the book’s heroine, is torn between two loves and two worlds, the outside, modern one she’s lived in and the Home Valley of her Amish family and the man she loves. RETURN TO GRACE is the middle book in a trilogy, but each book can be read on its own. Hannah, who is the bishop’s daughter, no less, has rebelled against her family and her people by going to the world to pursue a singing career. This radical move was triggered partly by her betrayal by rugged Seth Lantz, the Amish man she loved—and still loves. In an act of defiance, when Hannah takes some of her goth friends back to the Amish graveyard for a Halloween “booze and boos” party, someone shoots at them from the darkness. One of her guests is killed, and she is injured. Since this is considered a hate crime on Amish soil, an FBI agent is called in, a handsome loner who wants Hannah to help him solve the murder. Could her former Amish fiancé Seth somehow be involved? Torn between her love for Seth and her attraction to Linc Armstrong, the FBI agent, Hannah struggles to balance her past and her present. And when other bodies start to turn up and Hannah herself is threatened, who can she trust? This is the seventh romantic suspense novel I’ve written set in Ohio Amish country. Not only does the charming place serve as a unique setting for suspense, but I love writing about forbidden love. An Amish man or woman is not permitted to fall in love with an outsider. But then, Hannah considers her hidden passion for Seth forbidden too, since he betrayed her. Despite her attraction to him, she could never forgive him and take him back—could she? The clash of crime with the Amish belief in forgiveness makes for an emotionally wrenching story. Besides, the Amish don’t trust most police, lawyers or government agents, so it’s easy to write scenes in which the heroine must use her own resources to stay safe. Even if Amish lives are threatened, they cannot just use a cell phone to dial 9-1-1. No modern conveniences are allowed including land line phones and electricity. The world seems much darker at night when lit by a kerosene lantern. Horse and buggy travel often isolates the main characters, which can lead to especially desperate and terrifying situations. The Amish have a saying, “It’s not all cakes and pies.” (I’ve also heard, “It’s not all quilts and pies.”) In other words, despite how idyllic it looks to us outsiders, living Amish presents dramatic problems. In each of my rom/sus Amish books, I’ve focused on this. The peaceful, lovely settings of big barns, tall corn fields, farmers’ markets and rolling hills can provide some nightmare plots. FALL FROM PRIDE, book #1 in this trilogy, has been available since last summer; RETURN TO GRACE is out this month, March 2012; and FINDING MERCY will be out in July 2012—ironically, the same month as an anthology of three novellas of Amish-set rom/sus for which I’ve written a story. My novella is THE COVERED BRIDGE in the book called DARK CROSSINGS. 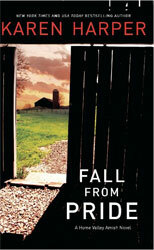 Two other Amish rom/sus writers, Marta Perry and Patricia Davids, have novellas in the book also. I live just two hours from Holmes County, Ohio, the Amish area I use for my setting and inspiration. My husband and I love to go there for a few days at a time, meet the locals, do research and, oh, yes, buy furniture, quilted items and eat the fabulous country cooking! All of that I also weave into my novels. Karen will be giving away a copy of RETURN TO GRACE to 3 lucky commenters. Giveaway ends 9pm EST March 7th. Please supply your email in the post. You may use spaces or full text for security. (ex. jsmith at gmail dot com) If you do not wish to supply your email, or have trouble posting, please email justromanticsuspense @ gmail.com with a subject title of JRS GIVEAWAY to be entered in the current giveaway. This giveaway applies to US and CANADA mailing addresses only. Wow, I don't think I have ever read a book about an Amish family. Closest was a movie I saw. I would love to win a copy of the book. Thanks for the great interview, very informative. I find your trilogy intriguing. The cover art too draws me in. I have never read anything regarding an Amish family and I would be interested in doing so. Please enter me in your "generous" draw. Was that movie Witness with Harrison Ford? That's getting to be an "oldie"--1985. It really got Americans who knew little about the Amish interested in them. They are fascinating people. The more stressed out we get today, the better their slower life looks. I love the cover art too--lonely but luring. It suggests the suspense, yet shows some of the beautiful aspects of Amish country. Since the Amish came from a rolling-hills area in Europe with fertile fields, that sort of land is where they setttled here in the US. the plot sounds really intriguing. i love books that have something to do with Amish life. The Amish say they live on the US, not in it. It's amazing to me that they can keep their culture intact in modern American. (Not that you don't see Amish kids on cell phones from time to time. Are they hiding them from their parents?) The Plain People still manage to keep 80% - 90% of their kids Amish, although they give them a 'running around' time to try the lures of the world during their teens. There's comfort in the familiar. I would imagine that being dropped suddenly into modern America can be overwhelming. Loved your Dark Amish trilogy - looking forward to reading this one. The Dark Amish trilogy novels were fun, but when I began my second trilogy (FALL FROM PRIDE, RETURN TO GRACE, and FINDING MERCY--this last one will be out in July,) I tied the novels together, not just by place, but by the three heroines being best friends. Still, in the second trilogy, the books can be read separately with no problem. Forgiveness is such a tough thing to do when you have been hurt. It looks like a story that has an interesting setting. This sounds like a very interesting book. I like reading about second chances. Forgiveness and the Amish--remember that terrible massacre of young school girls in an Amish school in Nickle Mines, PA a few years ago by a deranged man who also killed himself? The Amish went immediately to comfort the killer's family--some attended his funeral, etc. Again, they are amazing people. We have an email entry into the giveaway from "Sandra". I have never read a book about the Amish but this one sounds so intriguing, I may have to find the first book too. What a great plot. I've never read any "Amish" novels, thinking I'd not be interested in them, but Return to Grace will be my first one. Congrats on your success. Oops. My email is tanyawriter@hotmail.com and my website is www.tanyagoodwin.com. Tanya mentions a "great plot." I get a lot of questions about that--where do you get your ideas? your plots? After being published for almost 30 years, even I realize it's a good question. I think certain people are just born with the "what if" imagination. What if there was a barn arson? What if I took this idea from the newspaper but changed it a lot? What if a young woman falls in love not only with sp,epme her family would consider an impossible man to marry--but what if she'd become an outcast if she wed him? Emotional turmoil...danger... Stir together and hopefully get a good plot for a rom/sus novel. I have never read a Karen Harper book, but this one sounds like one I'd love! please enter me for it. Thanks,Maureen, and website visitors for your comments. Spread the word about this fairly new website! I think a lot of good reading these days have both suspense and romance, whether the spine says rom/sus or not. I know the historical novels I write have both elements, even though they are called historicals. Thank you for your kind words, Karen. It was wonderful having you here! Hi Karen- I'm chiming in a little late, but it's always good to "see" you my friend! JRS is a great place for RS fans to hang out and win prizes.